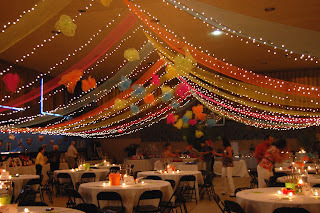 Party Ideas by Mardi Gras Outlet: Draped poly mesh ceiling transforms the school gym from Drab to Dramatic! Draped poly mesh ceiling transforms the school gym from Drab to Dramatic! Remember being on the prom decorating committee? The huge task of creating something magical out of something mundane seemed overwhelming back then. Movies like Footloose and High School Musical make it look so easy to transform plain school buildings into the extraordinary. This week I was part of a group given the task of transforming our children’s plain school gym for a festive Cinco de Mayo themed fundraiser. Lowering the towering dimensions of the high ceiling gym was a priority, as was making the old gym feel new for all the adults attending. To accomplish both goals, we created a new draped ceiling with white strand lights and rolls of brightly colored poly mesh. I think the end result accomplished all of our goals. The gym was transformed into an event worthy venue. The synthetic simamay poly mesh we used for this project is my new favorite product. In previous posts, I used natural sinamay for wreaths and wrapping projects. This new poly mesh sinamay comes in 21” by 10 yard rolls and is very inexpensive. It is so easy to use that it makes any one look like an experienced event designer. The mesh is not only durable, but also waterproof. It would work well for events both inside and out. This product is available in a huge assortment of colors and a few different widths. For our project we chose bright lime inspired colors from our invitation: hot pink, lime green, bright yellow, orange, and turquoise. Our plans included draping the ceiling in alternating color bands of these colors with white lights hung between the poly mesh. 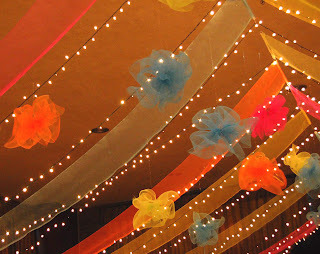 To add another layer of fun we hung paper lantern inspired puffs from this false ceiling. Initially, we were going to hang paper flower puffs from the center of the ceiling, but after working with the poly mesh we changed our minds. The poly mesh has enough weight and stability to hold a shape. 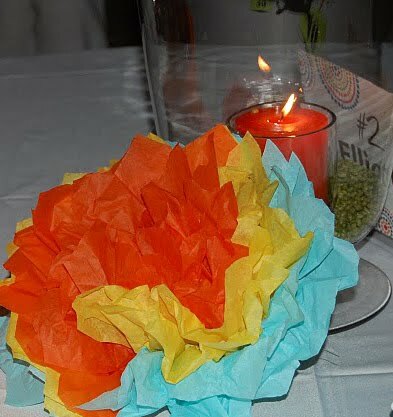 The paper flowers would have to be made on site at the last minute to retain their shapes. The mesh puffs could be made days in advance and were much easier to transport. In the end, we decided to make lots of mesh puffs in advance for the ceiling and saved a few of the more fragile paper flowers for last minute table decorations. To see a detailed tutorial on how to make the mesh puffs check out this post: Festive hanging puffs made of poly mesh. ADDED April 2011: After repeated requests for a tutorial on this ceiling treatment, we posted the directions here, Draped Deco Mesh Ceiling Tutorial. 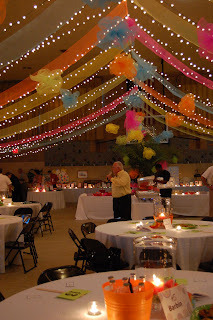 If you are planning an event in a large room check out the tutorial. The poly mesh rolls are great way to decorate a large space on a limited budget! I think my prom committee would be proud! I love this! Would you be willing to share how you actually attached the mesh to the ceiling? I am glad you like it! I was going to post on how we hung the draped ceiling and never got around to it. Sorry. I will recap the specifics in post soon. It is basically three wires across the gym ceiling that the mesh and lights hang from. If you email me at ideas@mardigrasoutlet.com, I can give you the specifics! Thanks!